Spending a lot of time on the Internet connects us together as people, but can disconnect us from our higher selves. One remedy for this is regular meditation. Kelly & I began meditating together once a week last March to see if it could increase our level of wellness. We loved it so much that we now do it 20 minutes a day, six days a week. Everyone has a different way of meditating. My preference is to combine deep breathing with chakra visualization. I take deep breaths, inhaling for 10 counts, then exhaling for 10 counts. As I inhale, I visualize energy flowing into my crown chakra, & as I exhale, I picture the energy activating that chakra. On the next inhale, I pull energy into my third eye chakra, & continue the breathing process for the rest of the chakras (throat, heart, solar plexus, navel, base of spine) until they are all activated. Once activated, I hold the energy in my body & visualize the things I desire in my life. Essentially, I use this time to ask what I want from the universe, and to see if it resonates with my higher self. The more vividly I can picture the active energy in my body, the more successful the meditation is for me. I was having trouble remembering the colors associated with each chakra, so I made an elaborate necklace (slash headpiece) to wear. Making the necklace helped me remember each color perfectly, and enabled my visualization to progress. This form of meditation is much different from the clearing-your-mind-of-all-thought variety. Ideally, I would like to practice both types of meditation, using visualization in the morning & head-clearing in the evening. Do you have a meditation process? What do you visualize? What do your chakras look like? Draw me a picture?! red one looks like period blood. joking aside, though, thank you for this post. i enjoyed the insight into your meditation practice. since everyone does it differently, its fascinating to hear what other people do. and i love the idea of making something to help you remember the chakras colors. plus what you made is so beautiful! love the photos, too! i would frame the image at the end!! aww thanks, & lmao the period blood effect is 100% intentional. i want to read a post about your meditation experiences please!! You are beautiful and amazing. I don’t think you know how inspiring this post is, or maybe you do. Meditation is so wonderful, I must take part in it more. 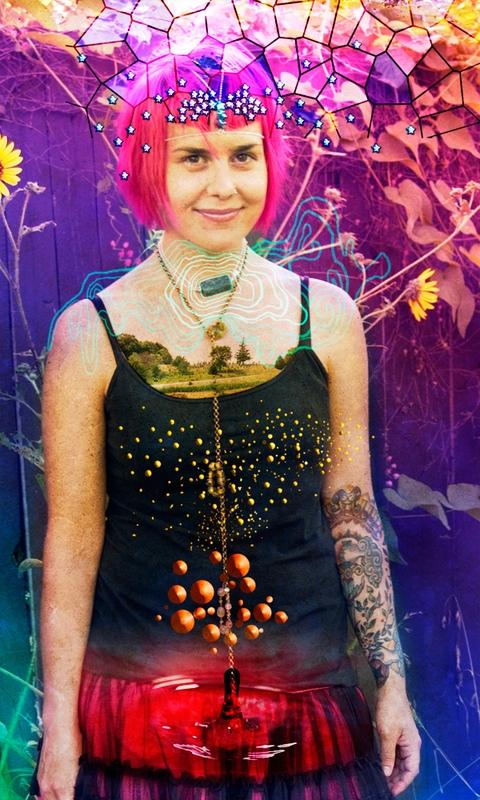 I love the photo you created and how you arranged your chakras with what they feel like to you. Wonderful!! i would love to hear about your techniques!